This recipe is brought to you by Mionetto. All opinions are my own. I’m not a beer girl at all, I’m a wine girl. I like a good sweet wine and I’m not afraid to say it. So, when Mionetto offered to send me 2 of the wines they offer: Prosecco and Moscato, I decided to give both a try. Mionetto sent me 2 bottles from the IL collection. “The products in the “il” line have been designed with a younger, more original image for light, informal, social drinking”. The moscato has a fruity flavor, is sweet and included bubbles. I enjoyed it after a long day while watching TV with my husband. It isn’t super sweet so my husband was able to enjoy it as well. The Prosecco Spumante is different from the Moscato. “This sparkling Prosecco is distinguished by a rich array of fragrances that include acacia blossoms, honey, and apricot. The palate is soft and smooth, yet at the same time crisp and dry.” The taste is too dry for me but perfect for a new recipe. 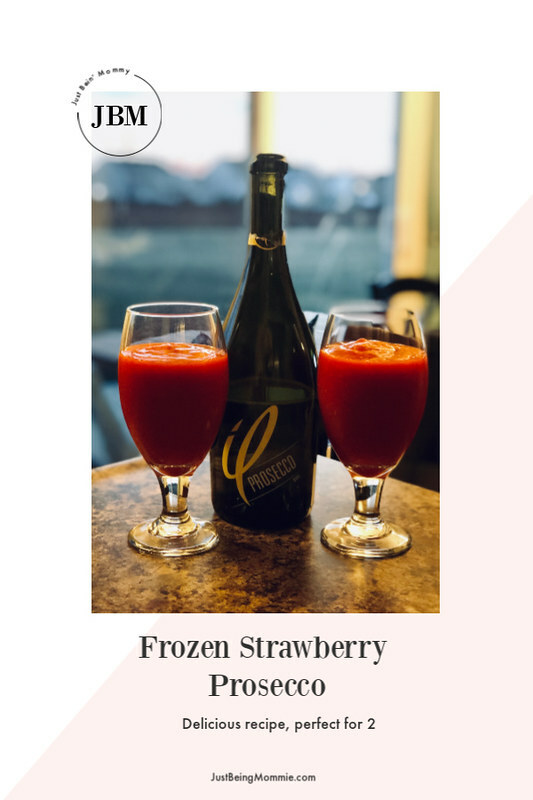 I combine the Prosecco with frozen strawberries and added honey to sweeten it a little. Delicious! and makes just enough for 2 to enjoy with your bestie while you gossip or watch a movie! Add all ingredients to the mixer and blend until smooth. Add more honey if you like it sweeter. Add a splash of orange juice if you'd like a little extra flavor.